Japan has a lot to offer in terms of sightseeing. With Tokyo nearby, we’ve overlooked some of the local sights. We found ourselves with a couple free afternoons last week, so we took advantage to explore Kawagoe and the area surrounding our neighborhood a little more. Neighboring Tsurugashima is a couple miles from our apartment. It’s a scenic walk when we cut through Oisezuka Park. 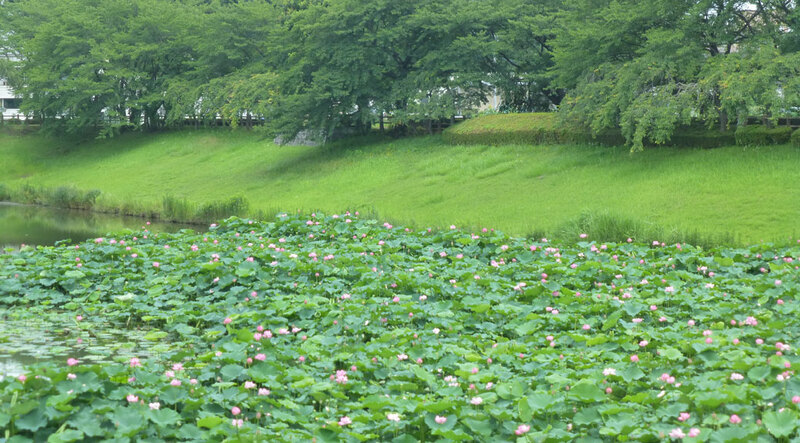 Lotus flowers grow from the pond near Oisezuka Park. The lotus flowers are starting to bloom. They grow out of the shallow ponds around the park. There’s a walking path with benches around this pond, which makes it a great place for a relaxing walk or to sit and listen to a local plucking away on her shamisen. 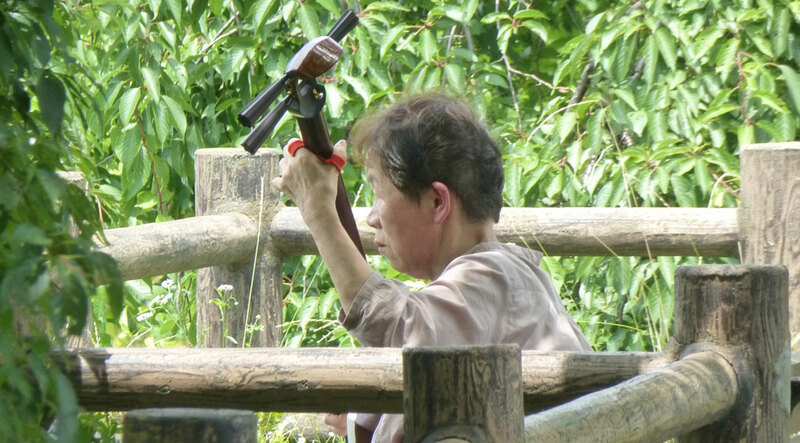 This woman was playing the shamisen, a three-stringed instrument similar to a guitar. This side of the Iruma River (入間川) is home for many local farmers. The rice paddy fields stretch the length of the river. It’s also home to a lot of wildlife, including a family of ducks who worked their way up and down the rows. 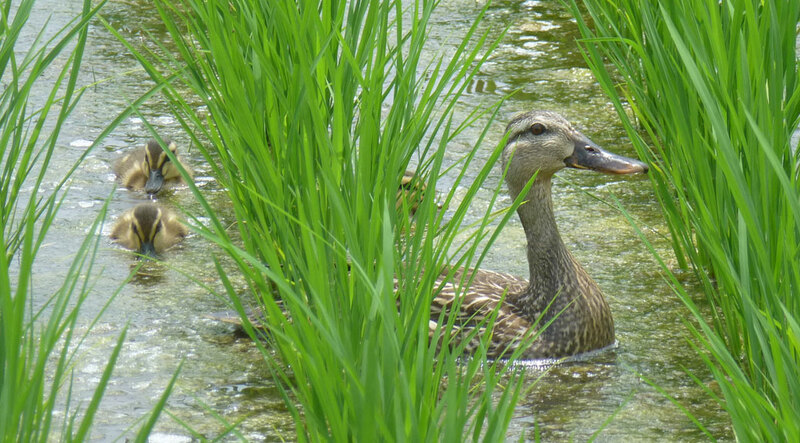 This mama had three little ducklings following her through the rice paddy field. 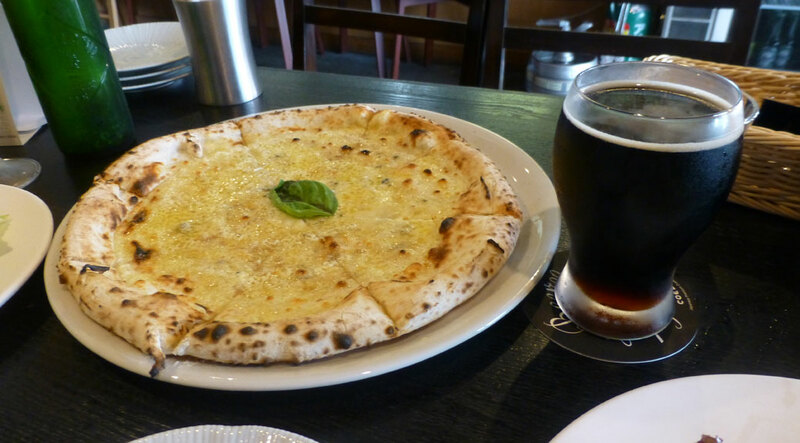 We originally headed for Wood Bakers Pizza in Tsurugashima, but the restaurant was closed unexpectedly. 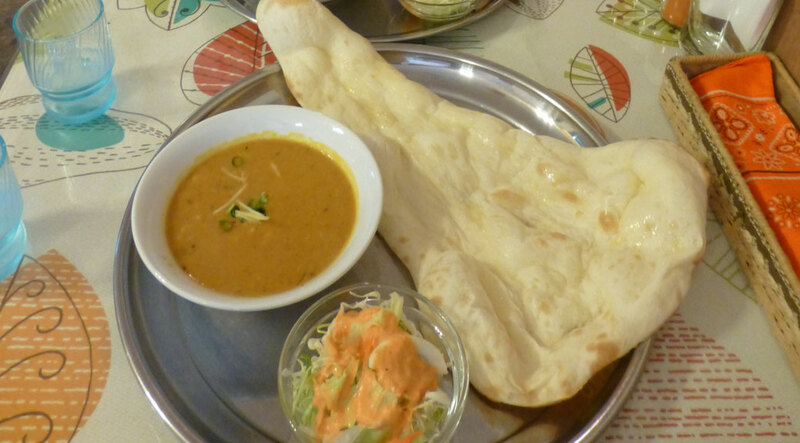 We found some really great Indian food nearby with naan larger than my head. A few days later we headed into central Kawagoe and the Koedo (or “Little Edo”) area. Edo was the name of Tokyo until the mid-1800s. This is the historic part of Kawagoe. But, first… pizza! The pizza shop in Tsurugashima also has a location in Koedo and it was open! It was a little after lunch, so we were the only customers in the place. The pizza is cooked in a pellet-fired oven using Traeger pellets from Mt. Angel, OR and Strawberry Mountain pellets from John Day, OR. They framed the bags and hung them on the wall as decor. The staff was laughing a bit when I started snapping pictures of the pellet bags on the wall, but when I explained Watashi wa Oregon kara desu or I’m from Oregon! they got pretty excited. 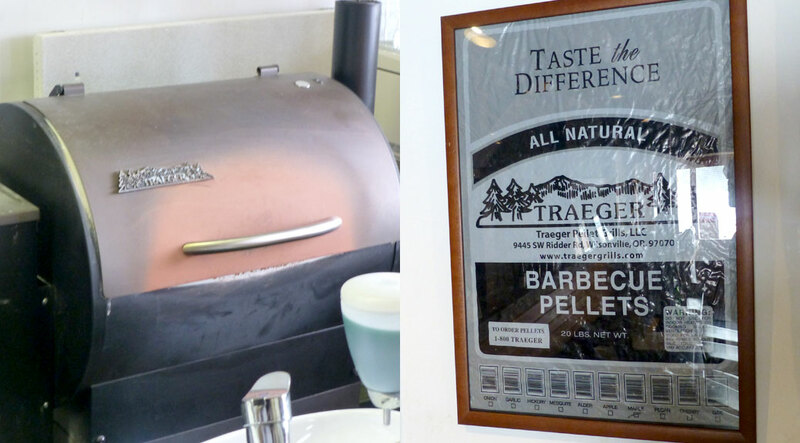 They pulled pellets out of the bag for me to smell and showed me their Traeger grill in the shop. We sounded out Ponderosa Pine together. Great pizza and more new friends! Stomachs full, we headed for Kita-in, a Buddhist temple originally founded in 830. The temple burnt down in 1202 and again in 1638. Because of the site’s importance to the Tokugawa shogunate, following the 1638 fire, several structures from Edo Castle were transferred here. Since Edo Castle was destroyed by fire in the Great Kanto Earthquake of 1923, the structures at Kita-in are the only remaining structures from the original Edo Castle. Gohyaku Rakan, or 500 disciples of Buddha. 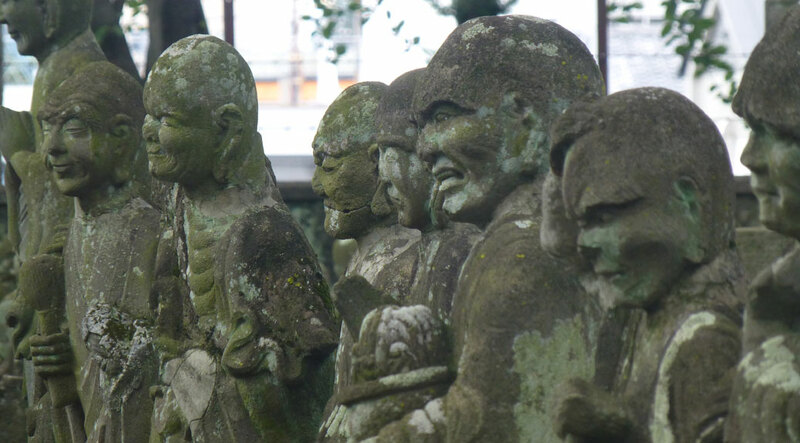 One of the highlights of Kita-in is the Gohyaku Rakan, or the 500 disciples of Buddha. There are 540 hand-carved statues that are so unique in design that no two are alike. 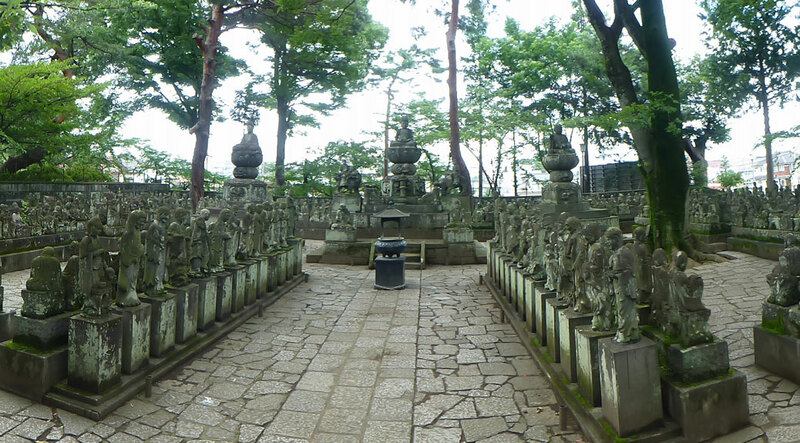 The local legend says that if you feel each of the statues in the dead of night, one will feel warm to you. When you return during daylight, you’ll find that the statue resembles you. Since the statues were gated off during the middle of the day, I’ll have to assume the legend is accurate. Along the way, we passed Naritasankawagoebetsuin Hongyoin Buddhist temple. We were drawn in by the rhythmic pounding of Taiko drums and haunting Buddhist chants. 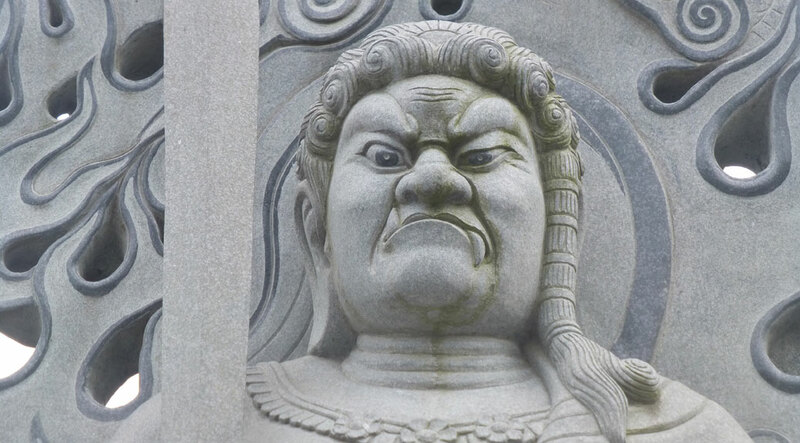 In addition to the shrines, there were also great statues, including the gate protector who didn’t look like someone you’d want to run into in a dark alley. The guardian at Naritasankawagoebetsuin Hongyoin Buddhist temple. Kawagoe has several more sights to see, but since they’re spread across town and we were racing the rain, we decided to save them for another day. I don’t know about the statues feeling warm and all, but The guardian at Naritasankawagoebetsuin Hongyoin Buddhist temple looks a lot like you Robert! Maybe you should feel his head and night. We have the same grumpy face, that’s for sure! I’ve never seen you with a grumpy face Robert. You are one of the happiest people I know.